The day of my first triathlon had arrived, it was May 15, 2011. 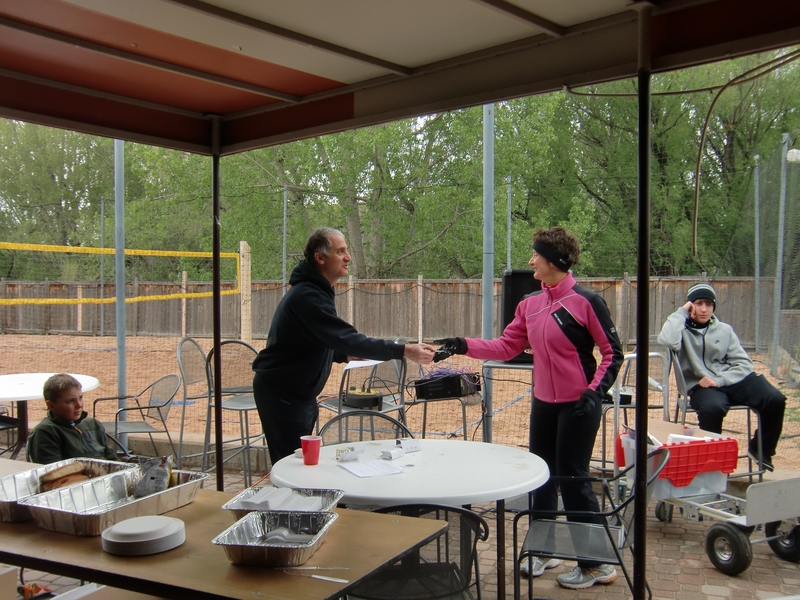 @CoachCary had also previously given me input on what and when to eat on the morning of the race. This is what I did, the key being DO NOT eat anything new on race day. Only eat those things you know your body likes that do not cause bloating. Alarm set for 4:00 a.m., I got up at 3:45 a.m., no alarm needed. I drank about a liter of a blend of Gatorade and Electrolyte enhanced water. I ate Oatmeal with bananas and toast with peanut butter and honey. In all, I ate about 700 calories. I stopped eating no less than 2 hours before the start of the race. I allowed enough time to go potty; that is important. You do not want to deal with an endurance race if you haven’t had your morning bathroom routine; if you know what I mean. I stopped drinking volumes of liquid 1 hour before the start of the race. It was drizzling and cold. I packed variations of gear, all of which I had tested before as the rule is NEVER test anything new on race day. I was prepared. The transition area opened at 5:30 a.m., I was there. I picked my spot, racked my bike and setup my stuff. I then mentally, walked through the different parts of the race such as exit door from Pool into transition area, Bike Start, Bike Finish, Run Start, Finish! Cary had suggested I do a warm-up swim. As always, I followed the advice of my coach. I swam about 150 yards in the warm-up pool. We then lined up based upon our estimated swim time which we provided at the time of registration. And, one-by-one swimmers were started about 5 seconds apart to begin the snake swim in the EPIC pool. Getting close to my turn I was excited, I was nervous but I knew I was ready. The starter asked, “Are you ready?” Yes! 3-2-1 GO! Exiting the pool the outdoor temp was 37 degrees. I pulled on my bike jacket, put on my helmet, bike gloves and ran with my bike toward the Bike Start…oops, forgot my race number and back I went to collect that key item. Once on the road I realized that while it was wet it wasn’t icy. Still being a rookie cyclist I was cautious as was necessary. I remembered the tips from Joe V at Giant cycles. I soon realized that I was passing more people than people passing me. Three laps of the circuit would complete the 12 mile bike leg. Seeing my guys and hearing them cheer me on with each completed loop with little guy yelling “Go Momma, Go!” (hence the name of my website being Triathlon Momma) was a thrill and it did make me go faster, I think. Off of the bike and running Zen into T2. After I re-racked Zen then helmet off, bike shoes off, bike gloves off, running shoes on, bike jacket off, running jacket on, running hat on. I was off and running! Running after biking feels weird, especially after a longer ride, which is for a later post, but even after a 12 mile bike ride you are not running on “fresh legs”. Your feet and legs are not moving in fluid motion but after about 5 minutes or so things start to loosen up. Each mile is marked, and I swear that the first mile is actually 2-3 times further than that. It seriously seems that the first mile takes FOREVER, mile two and three seem better. My run was uneventful and while I was exhausted by the time that I saw the finish line ahead, I was thrilled. As I pressed forward and crossed the finish and timer chip was removed. I saw my guys and heard my time. My goal from Cary was 1:30 and I had finished with a time of 1:21. My goal of finishing, finishing strong and finishing fast was achieved. 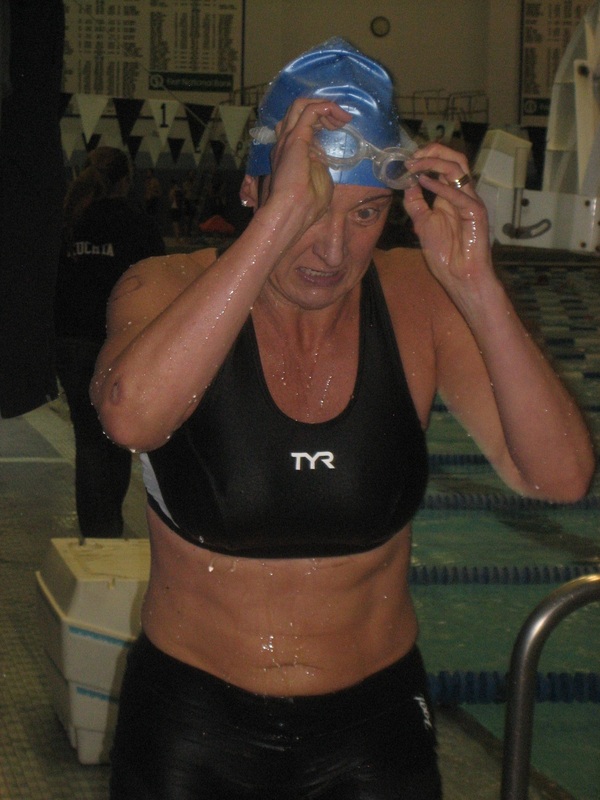 The fast part is all relative, but for a former FAT girl, first time age-grouper triathlete in her late forties my time was good as it earned me a 2nd place. This entry was posted in It's NOT the Destination...It's the Journey and tagged endurance race, Multi-Sports, Sport, transition area, triathlon. Bookmark the permalink.